Zinc & Colour Cr3 Plating. Mainly used in the electronics and car industry, this is a protective, RoHS compliant finish and an ideal base for painting. 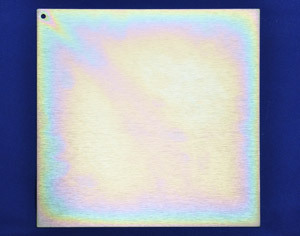 The finish produces an iridescent passivate film and has a characteristic green/yellow colour. Produces a highly protective blue/clear finish with good corrosion resistance, an excellent base for subsequent painting. Can be used to coat brass, copper and steel, mainly used in the electronics industry. Permanent and attractive Matt grey decorative finish, used in home, aircraft, electrical and medical industry. This coating offers good resistance to corrosion and a significant reduction in electrical conductivity. A chromate conversion coating for aluminium and aluminium alloy surfaces. This is often used in aircraft and by the Ministry of Defence where a protective coating is required to improve corrosion resistance which has the added benefit of the aluminium remaining conductive using this finish. Iridite ncp was developed in response to the ELV, RoHS, and WEEE directives. Features:- An environmentally friendly chemical process that produces a protective conversion coating on aluminium and its alloys. Elimination of the use of hazardous hexavalent and trivalent chromium, corrosion protection that rivals conventional chromate conversion coatings when tested in accordance with ASTM B117, passes the requirement of MIL-C5541 for electrical contact resistance for class three coatings. Provides excellent primer or paint base, no aging or curing required before topcoat application. The baking of treated parts does not affect the coating as with traditional yellow chromates. We cover Fareham Havant & Portsmouth in Hampshire together with Chichester, Midhurst, Littlehampton & Worthing in West Sussex.